If you want to advertise Heinz Baked Beans to a British audience, the best thing to do is to take a song sung in a language that almost no Brit would understand and use that as the soundtrack to your pitch to get people buying everyone’s favourite toast topping, isn’t it? 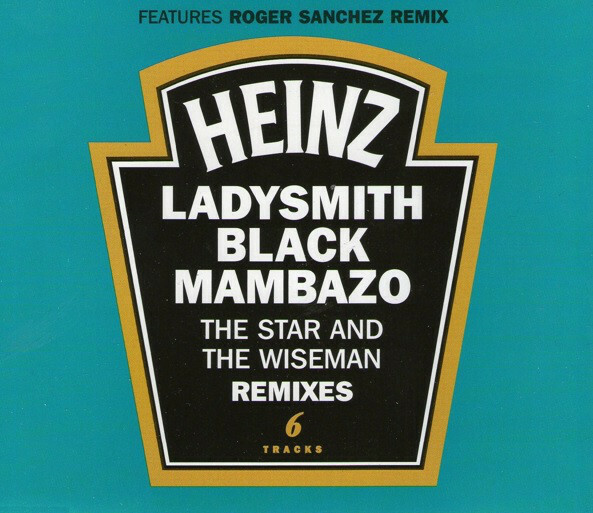 Put in those terms it sounds a bit far fetched, but this is exactly what happened with Ladysmith Black Mambazo’s ‘Inkanyezi Nezazi (A Star And The Wisemen)’ in 1997 when it was chosen to be the music for the baked beans ad. But this is perhaps a testament to the power and the beauty of the voices of the Mambazos. They could be singing the telephone directory for all the Brits knew, but boy could those voices shift the beans. Despite what I have just said in the previous paragraph, the words are not trivial or a telephone directory. They talk of the coming of Christ and the wise men and the star as the English subtitle says. There is a reverence and a lullaby quality to the singing which shows the strong faith that the group show in this and many other of their songs. It is difficult to find new ways of raving about the beauty of the harmonies that Ladysmith Black Mambazo produce. The words one has at one’s disposal seem to be too inadequate to describe the feelings that the music gives one. So my advice is to stop reading my ramblings about the song and just go listen to it, feel it, immerse yourself in it and just let the sound do the talking. Cool beans!